What is another word for pot? 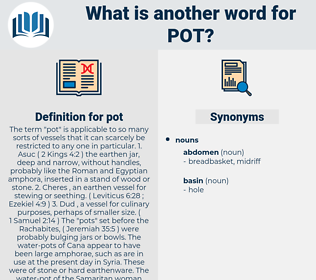 The term " pot" is applicable to so many sorts of vessels that it can scarcely be restricted to any one in particular. 1. Asuc ( 2 Kings 4:2 ) the earthen jar, deep and narrow, without handles, probably like the Roman and Egyptian amphora, inserted in a stand of wood or stone. 2. Cheres , an earthen vessel for stewing or seething. ( Leviticus 6:28 ; Ezekiel 4:9 ) 3. Dud , a vessel for culinary purposes, perhaps of smaller size. ( 1 Samuel 2:14 ) The " pots" set before the Rachabites, ( Jeremiah 35:5 ) were probably bulging jars or bowls. The water-pots of Cana appear to have been large amphorae, such as are in use at the present day in Syria. These were of stone or hard earthenware. 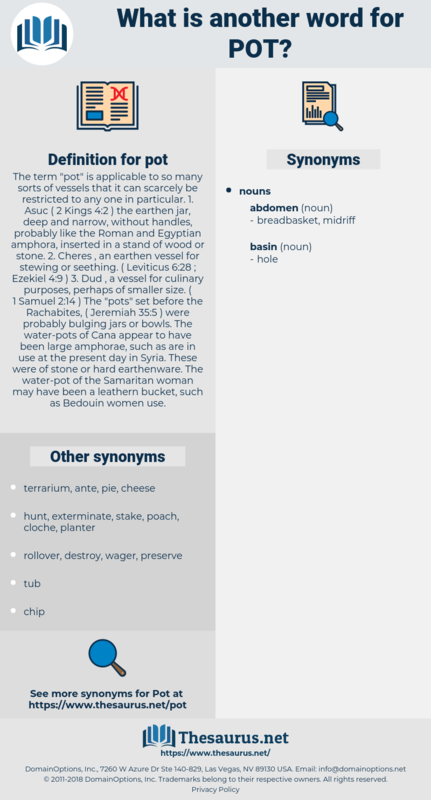 The water-pot of the Samaritan woman may have been a leathern bucket, such as Bedouin women use. ODSS, dive, casserole, potty, coffeemaker, weed, vase, cooker, bucket, firecracker, pool, pan, bottle, basket, pottery, crucible, stash, jug, pitcher, tub, purse, spliff, wok, path, poison, rooster, pod, dish, envelope, locker, loot. peeved, pip out, pittidae, paiute, pop out, photo, peptide, pet, pity, peat, padua, pithead, pied, pupate, peewit, piute, pipit, pay out, pd, petty, potato, pood, Pee Dee, piety, pay heed, put, pit, poitou, poet, poppet, peaty, put to death, path, phot, patty, pith, pithy, papeete, paved, put away, poop out, pedate, pipidae, phaeophyta, putty, petitio, pat, puppy fat, pitt, pea pod, puffed wheat, pud, pt, phd, puttee, pid, poppy day, paid, putt, potted, pie-eyed, put out, pate, pita, puffed, peyote, petite, pout, pahautea, pieta, pad, potto, pitahaya, Ph.D., pitot head, pipette, pewit, pipet, pith hat, pitta, puff out, peabody, popeyed, pothead, putout, Pott, potty, payday, PDA, pod, pythia, padded, patio, padda, pitot, puppet, ptah, paddy, PTO, pathway, pitted, pivot, pedwood. dixie, kettle, stockpot, teapot, coffeepot, boiler, caldron, saucepot, cauldron, urn, pottle, marmite, Dutch Oven. engraft, embed, plant, implant, imbed.